WOOD BATHTUBS - SCULPTURE AND FUNCTION. We handcraft our wood bathtubs from distinctive sustainable domestic and exotic hardwoods. Each is then finished with a specialized clear composite barrier for unmatched durability and longevity. 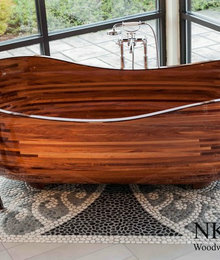 These wood bathtubs offer you the luxury of fine art furniture as the centerpiece of your bathroom. Not to mention an unparalleled soak. 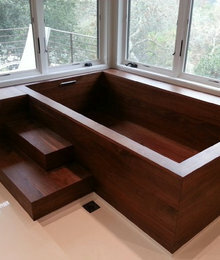 From our studio in Seattle, Washington, we can ship our custom wood bathtubs anywhere in the world.